Today is the Feast day of St. Joseph the Worker! There are some pictures of Joseph I don’t appreciate so much. They present him almost as soft, effeminate like he just came out of a beauty parlor. It appears he never worked in the real world and has not a wrinkle on his clothes or a speck of dirt on his hands and feet. I understand why artists paint Joseph this way and why churches have statues and images of the flowery, dainty, “European” Joseph with his fair hair. It is because art tries to reveal the inner qualities. This soft art tries to show the righteousness, holiness, kindness and love of a man who cared so deeply for God and his family. But Joseph was anything but a fair-haired, effeminate man with soft skin. Joseph was a manly man. His hands were calloused, his face was brown and creased from the sun, his arms and legs were like iron from walking, lifting and working. Quite the opposite of how he is often portrayed. We are told that Joseph was a carpenter. The word for carpenter in the Greek of the New Testament is tekton which means one who works with hard materials like wood, stone or metal. In short Joseph was a laborer, a redneck, a rock mason. Someone had to quarry the rocks near Nazareth; someone had to chisel them with hammers to shape them for walls, houses, etc. Most historians believe Joseph and Jesus were construction workers helping build the city of Sepphoris. You see here a few of my favorite pictures of St. Joseph, probably better representing the way he and Jesus really looked. Rough hands, brown face, tussled hair, coarse clothing and dusty feet. Imagine a construction worker, a farmer in the field, a lumberjack or a ditch digger. When I first showed this picture of Jesus standing in the wood shavings and dust to a friend with a devotion to St. Joseph he was scandalized. 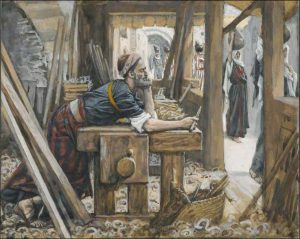 He shouted, “That is NOT St. Joseph!” He had been meditating on the soft, effeminate Joseph, not the rugged working Joseph of the rustic town of Nazareth. St. Joseph was a manly man and so was Jesus. They give us a good example of masculine men, working hard for their family. 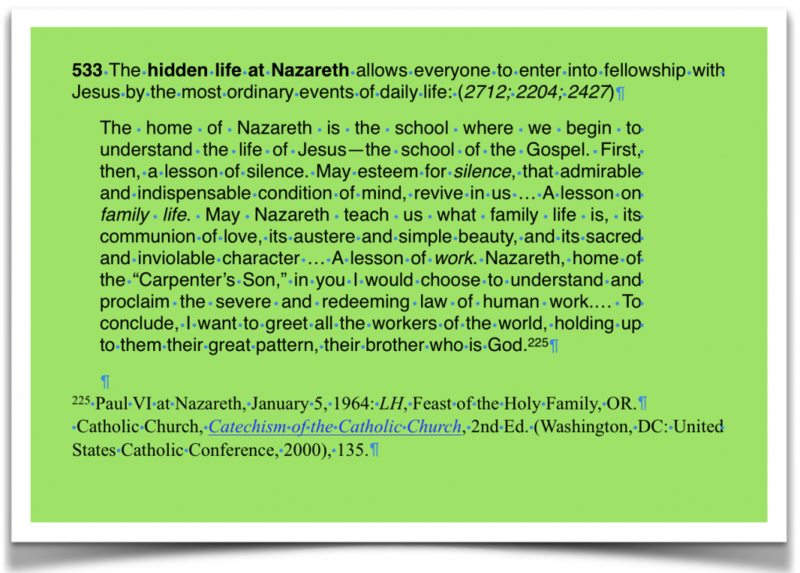 They demonstrated the dignity of hard work and the dignity of family life (CCC 533). Amen, I love the rugged images of both Jesus and Joseph. Joseph was the protector of the Holy Family. Even as a very independent woman, I have always appreciated the strength and the security offered by a rugged man who can work with his hands–like my father and my husband. I never liked the soft Jesus or Joseph. Gentleness, kindness, and compassion can be shown in the way a working man holds his child, or embraces his wife, or folds his hands in prayer. Thank you for sharing your schooled experience. Very realistic vision and your run fills in picture of why he is the Patron Saint of work. 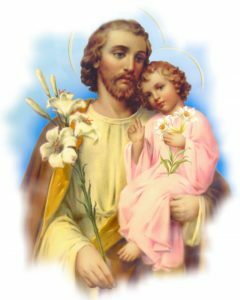 St. Joseph is the greatest saint of all, in my opinion. Can you imagine being the only sinner in that family? St. Joseph was an obedient servant of God, and protector of Mary and Jesus. What a guy! I have a soft spot for him; he truly is my favorite saint. I agree that he must have been a rugged man, used to strenuous, hard physical work. I believe Jesus was also, and I really don’t like seeing Jesus depicted as an anorexic looking man as is his corpus on many crucifixes in Catholic churches. Just a correction–March 19 is the Feast of Joseph, Husband of Mary(actually this is a Solemnity). The Feast of Joseph the Worker is May 1. It is started to counter the communist May day celebrations.